In my review of The Fiery Heart, I wrote a letter to Sydney and Adrian. Now, I've got a little letter to the author. While I enjoyed the Vampire Academy series, I have loved the Bloodlines series. There's something Sydney and Adrian that has me so invested in their story - individually and as a couple. I loved them both from the very beginning, even with their flaws and frustrating moments. I relate to Sydney's rule-following ways and so enjoy her character growth. Seeing her struggle to find her own strength, to know her own mind, has made for such a great reading experience. That's even more true in Silver Shadows. While I was nervous for Sydney, I also had faith in her. She's no damsel in distress! I love the way her brain is always working and how she's gained so much confidence in herself and in her abilities. I love the way Adrian remains true to himself, to the person first introduced in the Vampire Academy books, while still showing remarkable growth. He's taking himself more seriously, and it's so much fun to see him start to succeed. But I'm not going to lie... I was pretty mad at him at the beginning of this book. It's a good thing he started to get his act together, but he better not fall apart like that again. I JUST CAN'T TAKE IT! But most of all, these books are about the two of them together. I just enjoy their love story so much! I like how they push each other, balance each other out and make each other better versions of themselves. I feel like this story focuses so much more on the relationship and characters at its center, which makes it my kind of book. I know the plot is still there - it makes for an exciting and gripping read - but I still feel like this series has a different tone than Vampire Academy. And somehow, it just completely works for me. 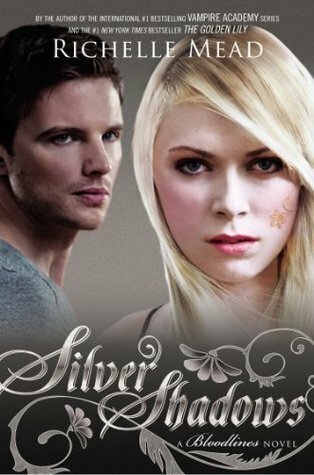 You've upped the ante in Silver Shadows. I was on the edge of my seat the entire time I was reading! And, as I know from past experience, you aren't afraid to make bold (and sometimes heartbreaking) decisions with your stories. I was scared of what was going to happen! I loved seeing some of the threads from the previous books start to come together in this one, and I think it's leading up to a pretty epic finale. BUT THE ENDING?! AHH! How am I supposed to wait to find out what happens next?! I'm glad it wasn't as cliffhanger-y as it could have been... but I'm impatiently waiting to see how it all ends. GIVE ME MORE SYDRIAN NOW. Please. And thank you! In case you can't tell, I'm such a fan of this series! From the focus on the characters to the epic romance, these books just work for me. I know some people will be shocked to hear it, but I actually enjoy these books and characters more than I did the Vampire Academy series. Those had a bit more world-building and drama, yes, but I'm way more invested in this couple. And now I just need to read The Ruby Circle already! “What is it with you and girls, Adrian, dear? Why do they either mean nothing to you or everything? It's always an extreme." I loooved this book! A total 5 star and I think the best in the series so far. This ending didn't kill me as much as the ending of The Fiery Heart. I still think bad things need to happen to Sydney's dad and sister for what they did in that book.